*I like getting presents. Who doesn’t? But I like giving presents just as much. So by giving me this awesome gift, Okka also gave me the inspiration for a great present for a fashion nerd. 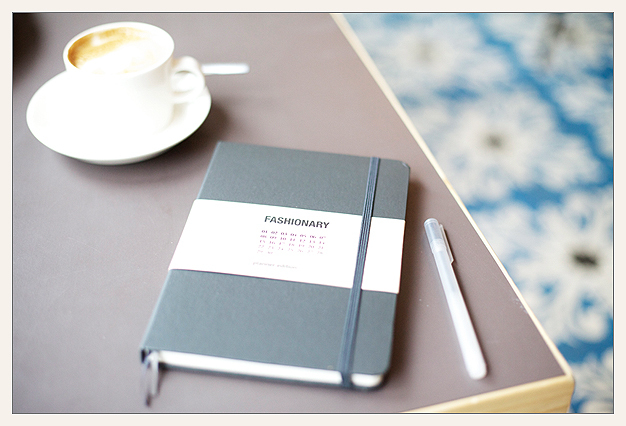 This fashionary is part dictionary, part address book, part weekly planner and I now use it to collect ideas for this blog. Also as an excuse for dropping sentences like “Who else knows the difference between a French and a Western cuff?” Like I said: nerd. *Zara seems to have copied, I mean: been very much inspired by the Saint Laurent collection for the new season and that bustier is exactly what the bikini top looks like I want for summer. *You know you want to see David Beckham running around Los Angeles in his skivvies in the new H&M campaign. Even if he used a stunt double (for shame, David!). *I also want you to see what his wife came up with for her fall/winter ’13 collection she showed in New York this week. Look 28 from Victoria Beckham is pretty much perfect for swanning into a fancy cocktail bar. *My favourite thing about New York fashion week so far is that Sandra is there to capture it all with her camera. *My second favourite thing is that the Fug Girls are writing about all the shenanigans once again for New York Magazine. *And my third favourite thing is this beauty look from Emily Weiss. *I’m not going to tell you how many times I’ve watched the video to Woodkid’s new song I Love You this week. It’s too embarrassing. Suffice it to say that it’s one of those songs you won’t believe nobody else came up with before, it’s at once familiar and just brilliant. *Here’s one of my favourite places to spend imaginary money right now: Swedish design shop Artilleriet. This entry was posted in a week in fashion, fashion and tagged Fashionary. Bookmark the permalink. Post a comment or leave a trackback Trackback URL. hallo. ich hab das video gerade zum 3. mal gesehen… danke für den link. ich mag deinen blog sehr gerne. grüße aus berlin! Sehr gerne. Wobei ich mich vielleicht eher dafür entschuldigen sollte. Denn wenn’s Dir so geht wie mir, wirst Du von diesem Lied nicht mehr loskommen! Dank Dir für das liebe Kompliment. Grüße zurück! Hey Penter, how nice to hear from you! Thanks to my friend Okka, I’m a big fan of fashionary already and I’m definitely planning to convert more people. I’ll let you know how it goes. For now, best of luck to you and the other fashionaristas (is that a word? It is now! ).